The social and interactive nature of web 2.0 (O’Reilly) and new media platforms provide a sense of freedom for users to produce or consume content according to their preferences. Platforms such as Facebook, Twitter and Youtube have, over the years, taken this concept to help them achieve success and draw more users. In the midst of this competition to provide platform for user interaction and user generated content, Twitch.tv rose into popularity, by providing access for ordinary internet users to stream their own generated content. Starting with games as their main interest, the platform has grown into a significant player in the web-based industry. From the start of 2011, Twitch’s popularity has kept on rising (fig. 1). With such quick-rise to popularity and success, it is interesting to observe how Twitch modulates content on their platform. Does the platform operate consistently with the notion that streamers have freedom over their content? Or does the way they operate allow for more audience control? By researching interaction on the platform, this project is interested in answering the question of whether Twitch’s monetisation policy has changed the relationship between audience and streamer, and its implication on who has more control over content? In attempting to answer this question, this paper will observe Twitch’s monetisation policies and user-streamer interaction to understand how these mechanisms affect streamer-audience relations. The project will also look into audience numbers using online tracking tools from “Socialblade” and “SullyGnome” to identify its relation to types of content that audiences are consuming. Findings from the two analyses will then be discussed, in the context of content control, to identify the balance of control between audience and streamer on what content is being produced. Findings from this project can add to the discussion of user perceived freedom over their content in a social-media or other modern web-based platform. Twitch is a live streaming platform centered around video games, that allows its users to watch content directly from one of their devices. It also allows them to create content and stream any video game they want. The popularity of the platform started to rise rapidly from the start of 2011. This led to Amazon buying Twitch for 970 million dollars in August 2014 (Kim). As of now, the amount of viewers and viewing hours on twitch continue to rise (fig. 1). These increasing interests make Twitch a feasible platform for content creators to be active on. The result is that there are a huge amount of streamers playing a big and diverse selection of games. To navigate through the wide selection, Twitch ranks on basis of most popular category followed up by popularity of the channel. This guides viewers to the more popular streams, who are essential for monetisation on the stream. One way in which streamers can make money through Twitch is with subscriptions. Twitch’s subscription requires users to pay several amounts of money depending on the type of subscription. Although users can still watch content without subscribing, the option to subscribe allow a user to gain exclusive benefits like custom made emotes. Another way to monetize on streamer content is through a feature called “bits”. Bits are cheering mechanism that allow users to interact with gameplay, by cheering at a certain moment (fig. 2). Revenue from subscription and bits will be shared between content creator and Twitch, the portion of the share is unclear. In addition to the monetization policies that Twitch offers, streamers can also generate revenue in alternative ways. For instance, viewers can directly donate money to the stream. The donation usually shows up live in the stream, by text and/or voice. These donations are being kept tracked off in the channel profile space, most of the time. This profile space is a free space which streamers can fill in how they like. So it can also be used for sponsorships and merchandise. The revenue that is generated by these means is all for the streamer. Now that it’s clear what Twitch is and how revenue can be generated by streamers, we can delve deeper into the relationship between the audience and streamers and how this affects the content that is being produced. Monetization has made online video creation a means to earn money which makes it a viable career option (Johnson et al.1). This created a surge in Youtube Celebrities and aspiring professionals (Garcia-Rapp 1). And like with all jobs, professionalism is needed. But the future of streamers is still uncertain because there is newness surrounding this career path (14). By being professional, a streamer has a higher chance of being successful. Professionalism shows in the technical quality of the broadcasting, like having a high resolution and a good quality mic. These “specs” (technical specification) are usually written down by the streamer in their channel profile (fig. 3). Some streamers get sponsored by using specific brands of equipment. The audience can use these specs to copy the streamer. Aside from high technical equipment, a streamer also needs to be understandable, entertaining and easy to follow (Garcia-Rapp 15). 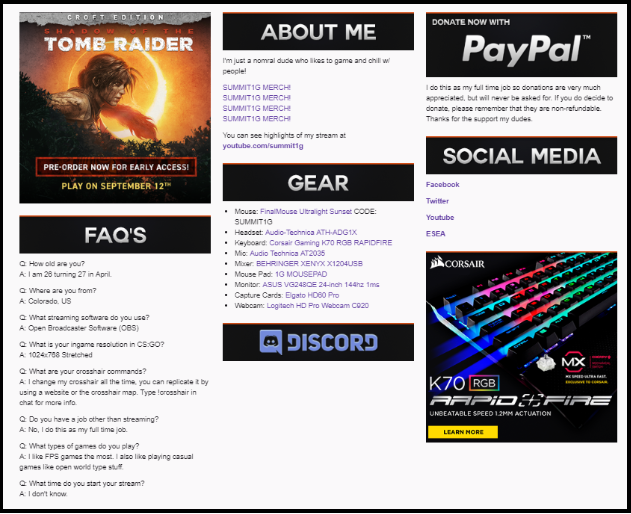 To get a clear overview of what their Twitch channel is about, most streamers use a similar layout/template. This template consists of the profile and the presentation of the content with extra information on the screen (fig. 4). Part of the template is the aforementioned profile to give useful information. Like the previously mentioned specs, but also who the streamer is, when they will stream and what game they are playing. Aside from these technical descriptions, Twitch profiles also have room reserved for the monetization. For example, there is a donate button and a list of highest as well as most recent donors. Popular streamers tend to mention sponsors or sponsored content. During the livestream, the streamer often uses a facecam to make themselves visible whilst playing. This makes the whole stream interactive because the audience is face to face with the streamer on a real time basis. Moreover, most streamers have notifications to show who has donated the most amount or most recently. Notifications relating to money are mostly shown live during the stream. When a viewer, donates or subscribes, that information gets shared live by text and sometimes by the streamer himself. By showing that the streamer cares about the donations he nudges viewers to donate more. The streamer needs to combine this professional presentation with a more personal touch to be successful, because the audience prefers a strong bond with the streamer (Garcia-Rapp 16). This interactivity is something that differentiates Twitch from traditional media. By sharing parts of their daily life, the streamers seems more real and can generate a stronger personal bond with the audience. Interactivity is reached by using tools like the chat box and (direct) communication with the audience. 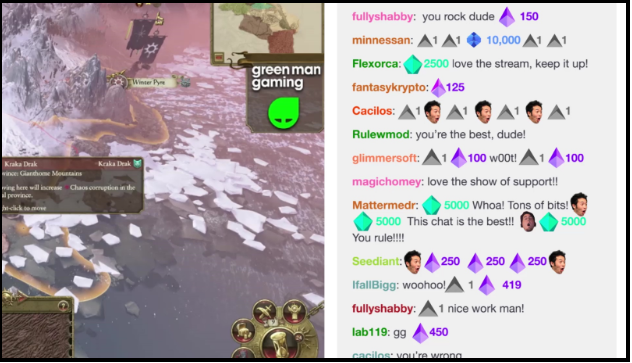 A chat box is a place where the audience can talk with each other, the streamer and respond to the stream. Subscribed viewers can use custom emotes to show that they are more hard-core followers and that they know what the norms of the community are. More popular streamers also have moderators who monitor the behaviour of their audience. This shows that the chat box can create a community that is hierarchic and follows certain norms. Aside from this, notifications and updates are also a way of interacting with the audiences. The streamer communicates with his audiences about the money they receive. With a facecam the audience can actually measure the response. However, to reach a strong personal bond, streamers need to be authentic. Without it, they will lose their audience and thus their income (Garcia-Rapp 4). The authenticity shows the audience that the social connection is real. This authenticity and honesty are highly appreciated (4). An authentic streamer can establish a strong social bond with their community. This results in affective ties and feelings of trust between audience and streamer (2). Thus it pays off for the streamer to show off the more personal side of his live, so that his authenticity can be measured. Hence, interactivity level and streamer’s authenticity matters, in generating user interest as well as maintaining monetisation on their channel. By allowing audience to engage in a more personal relationship, the streamer can monetise their content more easily and produce a community that supports the streamer despite their content presentation. As Gillespie argues, ‘platforms’ not just allow code to be written or run, but afford an opportunity to communicate, interact or sell (351). Twitch, being a peer to peer platform operating on real time basis gives audiences potential control over the content. The sense of interactivity that Twitch’s design and monetisation policies provide, raises one important question as to who controls the content delivered in the platform. 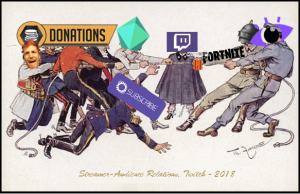 As Fogg states with regard to persuasive technologies, persuasion techniques are most effective when they are interactive which is one of the main reasons behind the success of Twitch as a platform (6). In traditional media, arguments can be made that because of TV’s and radios ad oriented business model, viewers have a certain degree of control over what content sells, thanks to the rating and share schematic (Herman and Chomsky 18). On the contrary, Twitch’s monetisation policies seem to go against this traditional rating based parameters. Channels are given the flexibility to determine how they want to earn money. Furthermore, streamers are seemingly more in control over what content they want to broadcast. Even though viewer ratings are important in determining success, streamers do not necessarily need to follow those numbers as a strict guideline. It is thus important not just to understand that relationships are activated online, but also how they are activated: by whom, for what purpose, and according to which mechanisms (Bucher 480). As Van Dijck points out “what is important to understand about social network sites is how they activate relational impulses” (161). That being said, data suggest that content consistency matters (Track Twitch Analytics, Future Predictions, & Twitch Usage Graphs). In fact, the top ten streamers on Twitch all broadcast the same type of content, that is Fortnite (2017) and Black Ops 4 (2018). The number one streamer, Ninja, even mentioned the importance of consistency in a tweet back in July. He lost 40.000 subscribers by not streaming for 48 hours (Grayson). This suggest that Twitch viewers prefer consistency from their streamers. His audience interest is higher when he played games that he is most known for, like Fortnite (2017), with his follower growth per hour growing at the rate of 1,470.76 compared to 1,069.13 when he plays Black Ops 4 (2018) (Ninja – SullyGnome). A similar trend can also be seen in channels such as Shroud. He is more known as a Black Ops 4 (2018) Streamer. When playing the game, Shroud gains an average of 1,059.53 followers per hour for playing Black Ops 4 (2018) and 1,082.87 per hour when playing Fortnite (2017). Meanwhile, when he play other game such as CSGO (2012), Rainbow Six Siege (2015) or Assassin’s Creed Odyssey (2018), his follower growth is less than 600 per hour (Shroud – SullyGnome). The trend is also apparent in a smaller channel such as Teosgame, where followers growth only go past twenty when he plays more mainstream games such as Fortnite (2017) and Rainbow Six Siege (2015) (TeosGame – SullyGnome). Thus, through the data presented, it can be argued that the audience do hold a certain degree of control over presented contents. Although viewer ratings don’t operate as a mandatory guide like the way rating systems work in traditional media, following what audiences’ watch and what’s popular can be a temptation for streamers to follow in order to achieve monetary success. This implicates that even though streamers such as Ninja and Shroud can stream any content that they want, audiences appetite for popular games such as Fortnite (2017) and Black Ops 4 (2018) is still important for said streamers to consider. Thus far, we have discussed factors that are influential in determining who has more control over streamer’s content. Looking at Twitch through Foucault’s conception of power as productive we can see that by allowing the user certain interface affordances, it encourages certain behaviour (Stanfill 1060). On the one hand, Twitch’s features and abilities allow interactivity in the stream, and has given the streamer more control over communication with the audience. Features such as notifications, chat box and profile page help the streamer showcase his personality and establish their own community. This has made the content creator more visible and prominent. Aside from the creator, the audience also play an important part in the stream. Donations are celebrated and monitored, and viewers can show their love for the stream and community in the chat by using the right emotes. This results in the audience becoming part of the broadcasted content. On the other hand, our research also concludes that audience demonstrates its influence in determining what kind of content (presentation) attracts viewers. This shows that there is a certain degree of pressure for streamer to follow the trend, because a bigger audience tends to mean more money. However, the streamer has the freedom to ignore the trend. Our analysis shows that the audience has a significant degree of control over the content, be it through interactivity or viewer ratings. The findings demonstrate that Twitch as a new digital platform provides a new type of interaction between audience and content providers. However, it is the streamer that profits financially from the monetization. And the moment a viewer stops giving money, he also lose a big part of his control. In conclusion, this paper attempts to answer the question of whether Twitch’s monetisation policy has changed the relationship between audience and streamer, and its implication on who has more control over content. In doing that, we have analysed how Twitch’s design and monetisation policies guides streamers to be interactive. We concluded that interactivity and authenticity play a huge part in social bonding between audience and streamer, and that it is needed to generate revenue. It’s the celebration and need of this relationship that differentiates Twitch from traditional media. On the other hand, we have also looked at viewer ratings data and discussed its effect on influencing streamers’ decision to stream certain popular content and in a professional way. There seems to be no significant difference between Twitch and traditional media on this point. Ultimately, our analysis demonstrates that the audience controls what needs to be streamed and that the streamer needs to be personal and authentic. In response to this, the streamer conforms to the audience’s needs and consequently capitalizes on it. We propose, that further discussion relating to Twitch’s audience and stream relationship should look into categories beyond gaming. This is because, Twitch’s monetisation has seemingly allow for other categories such as cooking and talk shows to also capitalise and take advantage in the platform. AnisaJohma. “BIGGEST DONATION ON TWITCH EVERRRRR”. Twitch. 2015. Accessed: 24 October 2018. <https://www.twitch.tv/videos/9509158>. Assassin’s Creed Odyssey. Designed by Jordane Thiboust. Ubisoft, 2018. Bucher, Taina. “The Friendship Assemblage: Investigating Programmed Sociality on Facebook.” Television & New Media 14.6 (2012): 479-493. Call of Duty: Black Ops IIII. Activision, 2018. Fogg, B.J. “Introduction: Persuasion in the Digital Age.” Persuasive Technology. San Francisco: Morgan Kaufmann Publishers, 2003. 1-13. Fortnite. Designed by Darren Sugg. Epic Games, 2017. García-Rapp, F. “‘Come Join and Let’s BOND’: Authenticity and Legitimacy Building on YouTube’s Beauty Community.” Journal of Media Practice, 18.2 (2017): 1-20. Gillespie, Tarleton. “The Politics of ‘’Platforms”.” New Media & Society 12.3 (2010): 347-364. Herman, Edward S., and Noam Chomsky. “Title Chapter.” Manufacturing Consent: The Political Economy of the Mass Media. New York: Random House, (2010): 14-18 . Johnson, Mark R., and Jamie Woodcock. “‘It’s Like the Gold Rush’: The Lives and Careers of Professional Video Game Streamers on Twitch.tv.” Information, Communication & Society (2017): 1-16. Rainbow Six: Siege. Designed by Daniel Drapeau. Ubisoft, 2015. Souppouris, Aaron. “Twitch Introduces ‘Cheering’ Emotes for Tipping Streamers.” Engadget, 27 June 2016. Accessed 23 Oct. 2018. Stanfill, Mel. “The Interface as Discourse: The Production of Norms Through Web Design.” New Media & Society 17.7 (2015): 1059-1074. Track Twitch Analytics, Future Predictions, & Twitch Usage Graphs – Social Blade. https://socialblade.com/twitch/. Accessed 23 Oct. 2018. Van Dijck, José. “Facebook as a Tool for Producing Sociality and Connectivity.” Television & New Media, vol. 13, no. 2, Mar. (2012): 160–76.